Peterborough United manager Steve Evans was delighted with his team’s 5-1 friendly success at Stamford AFC tonight (July 4). All 10 of his summer signings enjoyed a 45-minute workout with Siriki Dembele, a winger from Grimsby Town, scoring just five minutes into his debut. Matty Stevens, who spent last season on loan at Kettering Town, scored twice with George Cooper, courtesy of a csuperb lob, and Joe Ward also on target. The Daniels replied from the penalty spot through Liam Adams. 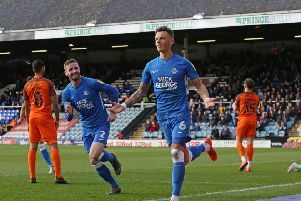 Posh striker Matty Stevens celebrates a goal against Stamford AFC. Photo: Joe Dent/theposh.com. “There were lots of good performances,” Evans enthused. “There were also some sloppy moments but that’s to be expected as we’ve only been back training for a week. “I was generally delighted. We had a lot of new signings playing together for the first time and it’s obvious we are still short in some areas. We probably need four, five or even six more players to complete the squad. “There were a few eyebrows raised when we signed Siriki, but I trust my own judgement and I liked what I saw when he played against my Mansfield team. The boy’s got the lot. Danny Lloyd in action for Posh. “Matty Stevens did well. I promised him a chance this summer and he took his first opportunity. His movement wasn’t always perfecte, but his workrate was exceptional. “George Cooper delivered a moment of magic which we need to see on a more regular basis. He’s a bit up and down. He was nowhere to be seen for 20 minutes and then delivered something special. “Youngsters Sam Cartwright and Lewis Freestone did well. Sam is only 18, but he has the body of a 28 year-old. Posh are next in friendly action at Bedford on Saturday (July 7), a match that now starts at 12.30pm to avoid a clash with England’s World Cup quarter-final against Sweden.